One of the challenges of being a ground-breaker is having no path to follow. But for six trailblazing women sitting in Myanmar’s parliament, a year-long mentoring program has helped them build the skills they need to change their nation’s perceptions of what women can achieve. The six women in the pioneering program – from four different parties, three of them ethnic parties – were paired with six experienced Australian women MPs across the political spectrum. Over the course of a year the women visited each other’s countries, explored their shared experiences of political life, and exchanged notes on confronting sexism. The Australian MPs also helped their counterparts learn about standing up to male colleagues in political debate, exposing children to civic education, representing their constituents and continuous campaigning across the election cycle. The pilot was a collaboration between IWDA and our partner Akhaya Women, a local women’s organisation in Myanmar led by and for women. 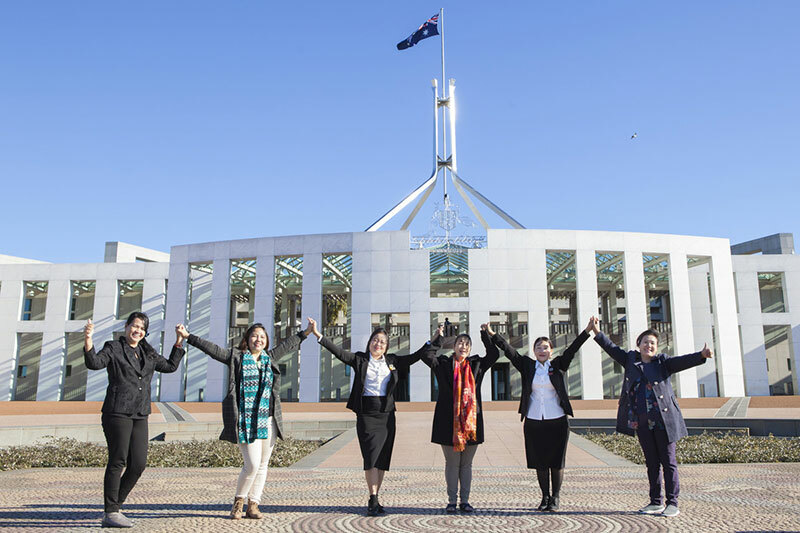 Following on from the success of this pilot, a new group of Australian and Myanmar women MPs will take part in the next phase of the program this year, kicking off with the Australian MPs visiting their counterparts in Myanmar in January. Myanmar women MPs met some of their Australian counterparts at Canberra’s Parliament House. The mentoring program was based on the EMILY’s List Australia mentoring scheme, which has matched new women candidates with experienced mentors for 22 years. More than 250 women have been elected to parliaments around Australia with support from the EMILY’s List program, including the first female prime minister, Julia Gillard, and Queensland and Tasmania’s first female premiers, Anna Bligh and Lara Giddings. While a number of obstacles emerged in the bilateral program – including due to language, cultural or time-zone differences, or the lack of resources available to Myanmar MPs – the mentees still significantly improved a range of skills that they self-reported on before and after the program, including the ability to work with men in their party, cross-party collaboration on women’s issues, and how well they could in turn mentor other women. Helping women find their voice is just one part of this innovative program from a country that doesn’t have a word for “mentoring” in the local language and where women make up only 10.2% of parliamentarians – after the number of women MPs doubled at the 2015 election. Despite breaking with traditional gender roles by running for election, the women didn’t necessarily see advocating for gender equality as a priority before they became involved in the mentoring program. Before the program, only one participant had raised legislation relating to gender equality. But by the program’s end, all mentees had made commitments to promote gender equality and work together as a cross-party team to pursue women’s empowerment. The program has reminded us yet again that, as former Victorian Premier Joan Kirner said of EMILY’s List, when women support women, women win. IWDA’s Women’s Action for Voice and Empowerment (WAVE) is supported by the Government of the Netherlands. The IWDA and Akhaya Women’s Myanmar Women Parliamentarians Mentoring Program is co-funded by DFAT.